Former National Security Minister Doug Singh, who was integrally involved in preparing a white paper which has been reviewed twice by Cabinet, told Amandala that Cabinet had approved the recommendations which were unveiled to the press last year. Since the November elections, new members were added to Cabinet, and they were recently presented with the white paper. According to Singh, the drafted legislation would go back to Cabinet to ensure that what was intended is being accomplished. Subsequently, the proposed legislation would be tabled in the National Assembly. 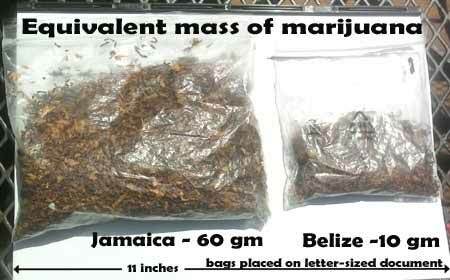 In the case of Jamaica, he said, they last year decriminalized 60 grams of marijuana, which is the full amount for which a person would be charged with drug possession here in Belize. Anyone found with over that amount will be charged with drug trafficking. Belize is only decriminalizing a sixth of what Jamaica has decriminalized. Singh said that Jamaica had also proceeded to include medical marijuana in its exemptions – effectively legalizing it for a purpose – something that Belize has not included in its set of recommendations. Whereas the new laws being drafted would allow for persons in possession of 10 grams of marijuana or less to face a fine and/or be committed to community service, they would also allow for the records of persons who have been convicted for possession within these limits to be expunged. “Too many young people have this following them, those who are seeking jobs,” Singh said. He noted that whereas for certain levels of jobs, employers do not usually ask for a police record, for basic entry-level positions they often do, and so the ability of persons who may have been caught with small amounts of marijuana to earn an honest living is adversely impacted. Singh notes that there is already a mechanism in place to expunge those records, because some years ago, when he was Minister with responsibility for Police, he had led a similar process which saw hundreds of records expunged following an amendment to the Criminal Code. The gamut of recommendations on the decriminalization of marijuana in Belize also includes drug education and rehabilitation for repeat offenders. Singh said that there should be a “firewalling of penalties to put into a fund” that could be accessed for drug education and rehab through entities such as the National Drug Abuse Control Council. A drug court, a separate initiative, is also in the works, which would allow persons who elect to do so, to appear before that court for drug-related infractions and crimes.